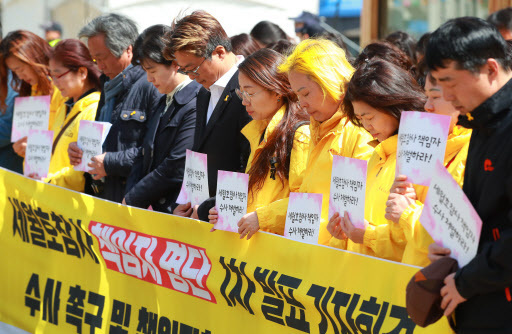 Bereaved families of the victims of the 2014 Sewol ferry disaster on Monday called for a fresh prosecutorial investigation into the event and punishment for those accountable, a day before the fifth anniversary of the disaster. Five years after the 6,800-ton ferry sank in waters off the southern coast on April 16, 2014, killing 304 people -- most of whom were high school students on a field trip -- the victims’ families said justice has not yet been served because of attempted cover-ups. Holding accountable those who have tried to obscure the truth behind the accident -- including former President Park Geun-hye and then-Justice Minister Hwang Kyo-ahn, who is now main opposition Liberty Korea Party’s chairman -- is the only way to make Korean society safer and allow it to move on, they said at a press conference at Gwanghwamun Square. “What we want in terms of finding the truth is not much. We demand punishment for criminals and murderers who asked the victims to stay still (aboard the sinking ship) and who did not order an evacuation,” said Jang Hoon, the father of deceased student Jang Joon-hyung. The first step is to establish a unified special investigation team under the prosecution with the power to investigate and file charges, they added, as ongoing cases related to the Sewol sinking are handled separately across several local and military courts. By creating a unified body, the families believe the probe and follow-up process -- indictments and court proceedings -- will be quicker and more responsive. The families released a list of 17 names of people they accuse of being responsible for disrupting rescue operations and efforts to determine the cause of the Sewol tragedy. They compiled the list based on investigation results by the prosecution and special investigation committee into the maritime disaster and the ferry, Jang said, amid slow progress in bringing justice to those they believe should be punished. On the list are officials from the Coast Guard, presidential office, National Intelligence Service, Defense Security Command, Oceans Ministry and Justice Ministry. The names include then-presidential chief of staff Kim Ki-choon, then-Coast Guard chief Kim Suk-Kyun, then-presidential secretary for national security Kim Jang-soo and then-National Intelligence Service chief Nam Jae-joon. The families accused them of abuses of power and manslaughter, the statutes of limitations of which are five years and seven years, respectively. They are planning to file complaints against them by around June, according to Jang. On Monday, the prosecution sent two former high-ranking officials from the Defense Security Command and two former presidential officials to the court on charges of abuse of power. They are accused of being involved in tapping the families of the Sewol victims and conducting illegal smear campaign online. “What we want to know the most is why the victims were not rescued when there was enough time and why they were not ordered to abandon the ship. We want to know whether it was because the government was just incompetent or there were other reasons,” said Park Rae-gun, co-head of an association of civic groups supporting the victims’ families. A petition on the presidential office’s website calling for a fresh investigation into the Sewol ferry disaster had garnered more than 127,000 signatures as of Monday afternoon. With previous committees aimed at finding the cause of the Sewol ferry tragedy bearing little fruit, the Special Commission on Social Disaster Investigation is now conducting an inspection into what went wrong in the rescue. The commission said that footage of Sewol that prosecutors had secured and which the Navy claimed it had retrieved may be different, raising suspicions of possible manipulation of the footage, at a press briefing last month. As the commission has no authority to investigate those involved and file charges against them, it plans to refer the case to the prosecution, asking it to open an official probe into the allegations. In the last few days, Koreans have been flocking to the joint memorial altar in Ansan, Gyeonggi Province, home to 261 student and teacher victims of the ferry sinking, to pay tribute to the victims. 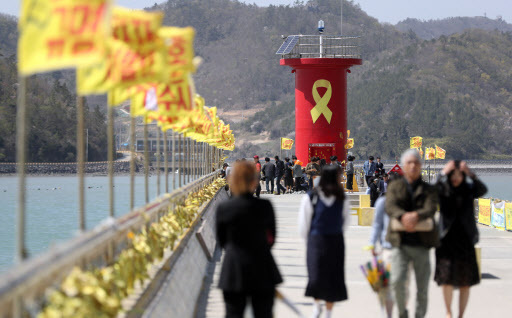 The island Jindo, which is near the site of the accident, and the port of Mokpo, where the ferry remains on a dry dock, in South Jeolla Province, were also busy with mourners. The official event commemorating the student victims of the sinking will be held at 3 p.m. in Hwarang Public Garden in Ansan, Gyeonggi Province, with some 5,000 people expected to attend. The event for other victims will be held at 11 a.m. in Incheon. A large commemorative event featuring various performances was hosted at Gwanghwamun Square on Saturday.